Having gained notoriety with its animated incarnations of famous fairy tales from Snow White all the way to Cinderella, Disney’s decision to take on a film that seeks to twist that narrative could be seen as a brave one. In actuality, it’s Stephen Sondheim’s Broadway musical that tackles the nitty gritty of that stuff, and the long gestating development of a feature film finally being given that extra push of momentum by Disney was just a chance for the big conglomerate to leap upon the idea and turn it in to a standard family friendly romp. While it’s a good thing that the project finally got off the ground, the uneven aesthetic and tone of the film is definitely a problem, and there are long stretches where it feels too schmaltzy and badly done to make a riveting story, making for a hodgepodge of different plot threads that sometimes fit together but at other times feel completely unnecessary, and long sections punctuated constantly by the characters’ increasingly more tiresome presences either bickering or lamenting in the form of song without ever really taking the plot anywhere. Some small salvation comes from its strong cast and particularly Meryl Streep and Emily Blunt, who give it everything in their respective roles and are let down by suspect direction and a film that never quite seems to know what it wants to do or what it wants to address. Nevertheless, Streep and Blunt are both wonderful at portraying the desires, opinions and plans of their characters and have the two best singing voices in the whole film, which means it’s fun to watch them at least. There’s also one sequence featuring the two princes as played by Chris Pine and Billy Magnussen where they perform a song and do garner quite a few laughs, but these moments of promise are quickly buried beneath the constant mire of uninteresting and seemingly endless twaddle that comprises the rest of the film. Sadly not all the cast are up to scratch, James Corden is unconvincing as the Baker and annoying as the completely perfunctory narrator and Lilla Crawford’s performance as Red Riding Hood is toe-curling enough to make you want to scratch a blackboard, but the film’s so uneven it’s hard to tell whose fault it all is. 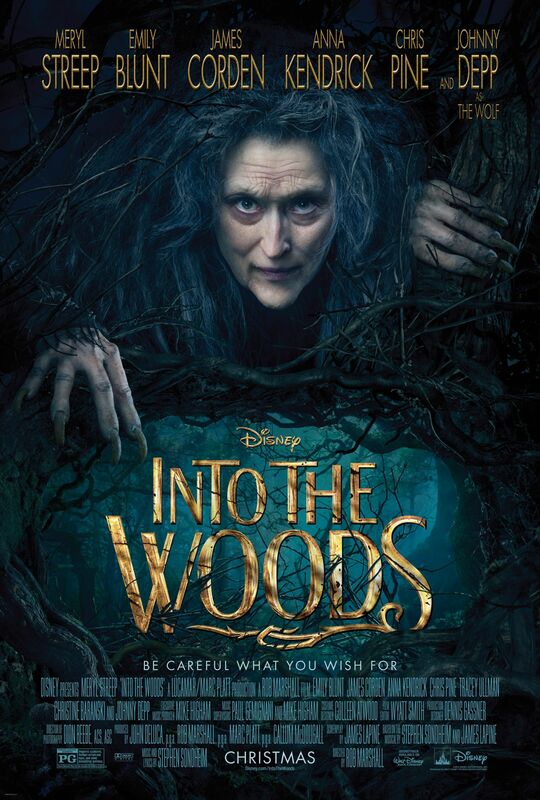 The major flaw of ‘Into the Woods’though is that it fails to get you invested, instead wishing to spend time regaling you with grand musical numbers about the deepest woes of the characters while expecting us to care, which it gives little effort to, beyond quick and half-hearted rehashes of the original tales. Sure, the audience will most likely be aware of the characters from other incarnations, but it’s the film’s job to ensure that we’re interested, and it simply does not do that. It’s a film that bears the hallmark of director Rob Marshall’s worst work, all show and no substance, and no amount of impressive set design is going to convince you to look past wanting a plot that doesn’t lose your interest because it’s given you no incentive to care. Annoying, bloated and a huge missed opportunity, the glimmers of promise only serve to make the disappointment worse.